Every now and then, a vape tank comes along that is special. It destroys everything else in the market and causes its competition to seriously raise its game. 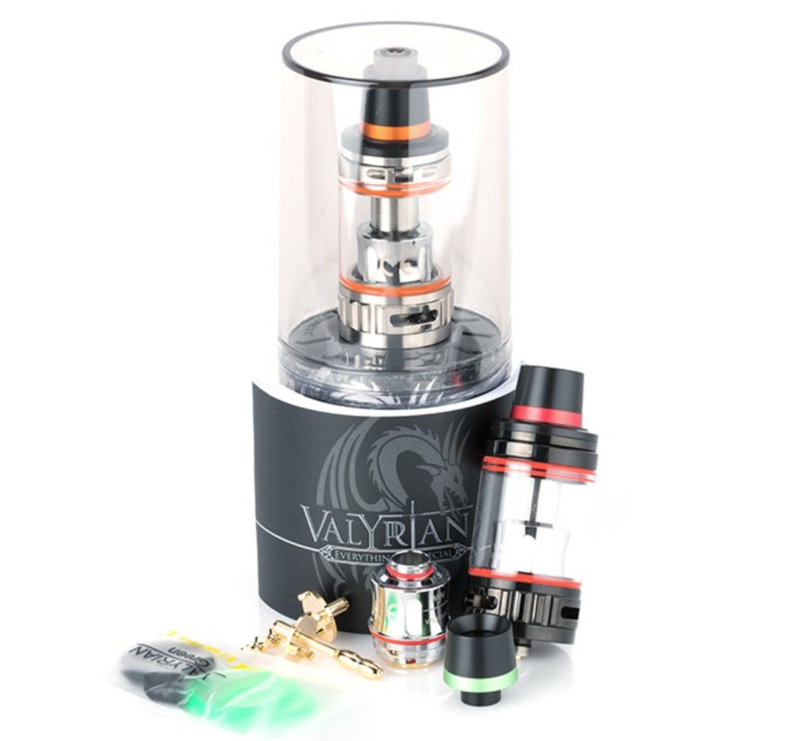 The UWELL Valyrian is this tank. It is a game-changer. To say this tank is special would be an understatement. For me, it is one of the finest sub ohm tanks ever created. From the coil heads to the flavor to the overall design and finish of the tank – everything is flawless. 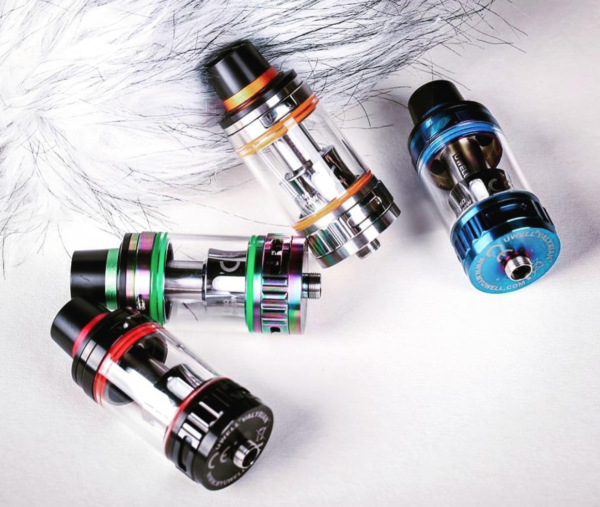 It’s a completely redesigned sub-ohm tank that is looking to once again regain its crown as king of the sub-ohm tank market. I’ve been REALLY looking forward to reviewing this setup, as the early reviews have been VERY positive. I was hugely disappointed by the SMOK TFV12 Prince after testing it out. The tank looked to have so much promise, with its flashy design and awesome selection of resin drip tips, but, once again, SMOK dropped the ball with its coils. I tested a myriad of options and only found one set of coils (T10) to actually be any good. And even then, they weren’t exceptional. 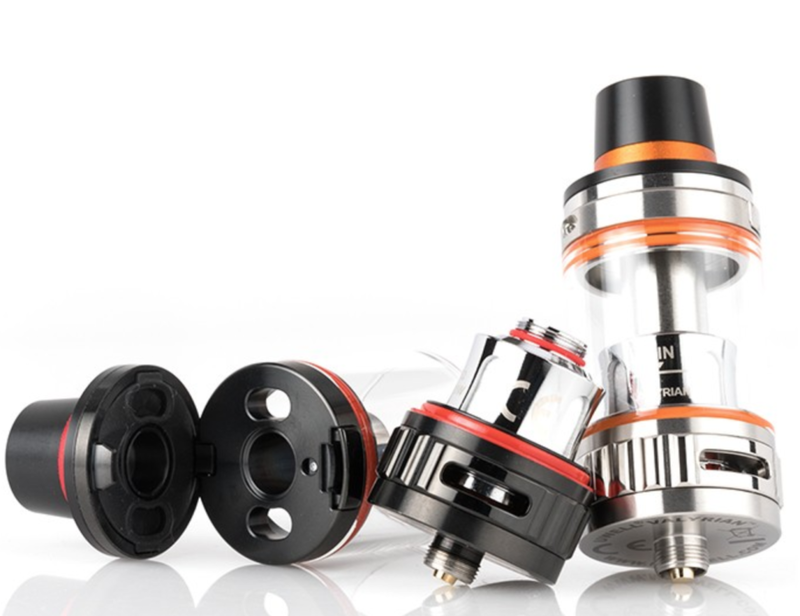 For a sub-ohm tank to succeed, and also beloved by consumers, it needs to pack in solid, reliable coils. Coils that you can install, prime and vape on for a week or so – at the least. Anything less than this is just not good enough. Even more so when you’re demanding $15 for three of them! Can the UWELL Valyrian do any better? I was praying to the gods of vape ahead of testing that it could because I miss having a proper solid sub-ohm around for when I’m traveling or on a night out. Basically, I was looking to the Valyrian to be my backup guy, the tank that picks up the slack when I don’t want to use an RDA. Does UWELL have the solution? The package is unique in that the Valyrian comes in a cylinder that is clear at the top half, beautifully displaying the Valyrian with the bottom half having a black background with a awesome Dragon with Valyrian in the middle. On the opposite side of the Dragon are the specs and what’s included. The amount of design work that goes into modern sub-ohm tanks, compared to just a few years ago, is kind of staggering. 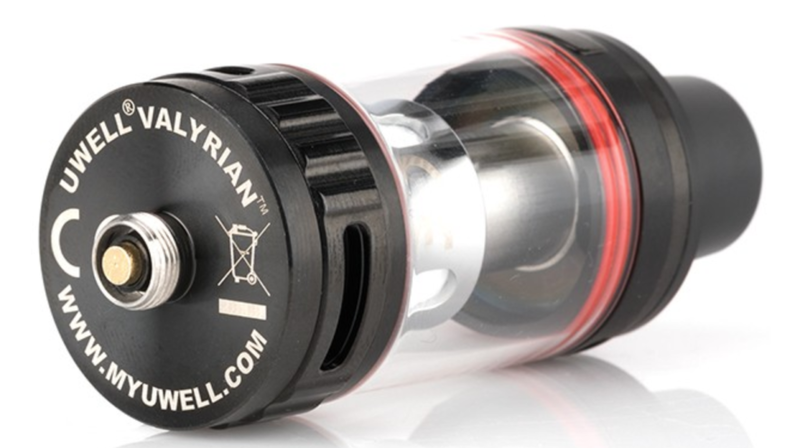 The UWELL Valyrian is no exception to this new law, either, with its precision designed chassis, range of color options, and myriad settings and options. The precision with which that tank has been made, and the attention to detail that has gone into its industrial design, is exquisite. It looks and feels every inch the premium sub-ohm tank is clearly pitched to be. The top-fill E Juice ports are accessed by clicking the button on the lip of the tank to release the hinge. 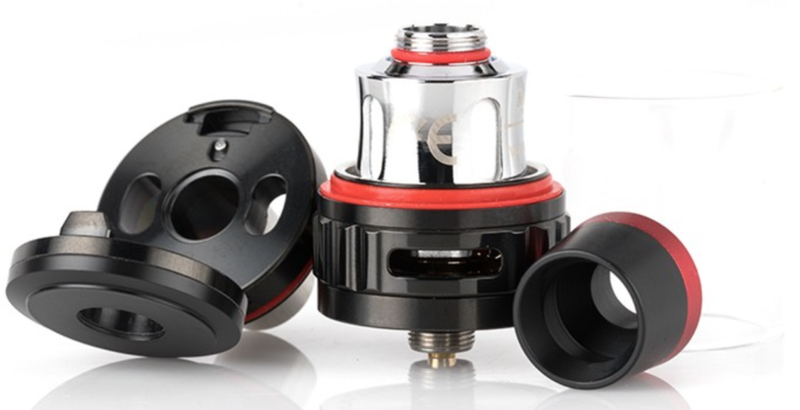 This ensures the top cap does not come off when it’s not supposed two, just like the new SMOK TFV12 Prince. The kidney-shaped holes are perfectly sized for a unicorn and drip-style applicators, so whatever you’re using to dispense E Juice will fit snuggly. UWELL ships a pair of drip tips with the Valyrian too, they’re identical, save for a different color ring on each. You’re free to use your own as well, though I don’t think many will; the drip tips it ships with a perfectly sized and feel great in the mouth. Overall, the finish, attention to detail, and overall composition of the UWELL Valyrian is superb. I looked and checked and inspected for any imperfections and found none. A month later, this still applies. 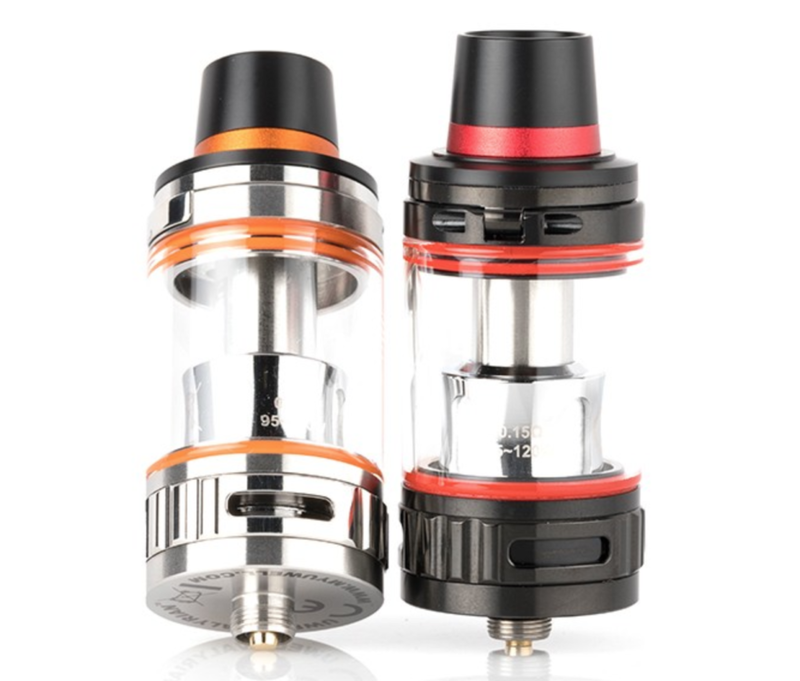 UWELL has designed the crap out of this tank and QC is very much on point. Upon juicing up the preinstalled 0.15ohm coil and filling the Valyrian I waited for a few minutes and then set my wattage to 80W and began to vape. Now, I was not expecting anything for the first few draws but right away I was blown away by not only the airflow, or the clouds, but the amazing flavor that is usually only found on a well built RDA. That’s right, you read that correctly: A well built RDA. The flavor fills your tastebuds much more than any other sub-ohm I have tested in 2017. It’s kind of mind-blowing in this regard. The airflow is fairly detailed too, so you can really fine tune the way it vapes. With the coils rating of 80-110W, I really wanted to push the Valyrian to a breaking point. I took the Valyrian all the way to 170W before the dry hits set in. That is amazing for a coil that is only rated to go to 110W. The only downside I came across during my time with the UWELL Valyrian is that it isn’t too great at really high wattages; the sweet spot is very much below 120W. For me, that’s fine though – I seldom run my tanks higher than 100W anyway. The reason for this is three fold: it’s better for my mod’s battery, it preserves the lifespan of coils, and it burns through E Juice at a far slower rate. For this reason, I wouldn’t necessarily call this aspect a con, per se, as hardly any tanks, save for RDAs, can truly operate at super-high wattages. If you’re after a solid performance with excellent flavour, the UWELL Valyrian is hard to beat right now. UWELL Valyrian Coils | How Do They Perform? It basically murdered the SMOK TFV12 Prince with respect to performance and reliability and that, combined with its excellent coil system and overall design, makes it easily one of the best sub-ohm tanks you can buy right now. The coils which ship with this tank are superb as well; way better than SMOK’s. You prime them, let them sit, and the vape. Since I’ve had the tank, I’ve ran about six or seven coils in it and the performance of all of them has been exemplary. I have not encountered any duds, and none of the coils have burnt out after a day or so. And for me, this is a really big deal, as pre-made coils are what let down most tanks these days. They’re expensive and they seldom work as advertised. UWELL’s are the exact opposite of this, however, with predictable, consistent performance, even at high wattages. I messed around with a bunch of different settings, though 80W-90W seems to be the sweet spot. At this setting, you get great flavor, massive clouds, and it doesn’t rinse through your battery and E Juice. It can go higher, of course, a lot higher, but this, for me, was the sweetest of spots to run the Valyrian. Having had many, many, many tanks, especially the Crown series and TFV series. I can safely tell you this one fact….the Valyrian is the best out there right now. Nothing else comes even remotely close. The coils are exceptional, providing excellent, consistent performance, alongside truly exceptional flavor. If you’ve been burnt by sub-ohm tanks in the past, got angry about the poor performance of their coils, you HAVE to check out the UWELL Valyrian. When a SMOK tank and coil system are working properly they’re great, but as Drake noted in his review of the SMOK TFV12 Prince, the performance is so unpredictable it is impossible to know what you’re getting on a day to day basis. This is where the UWELL Valyrian cleans up: it provides excellent flavor and clouds, as you’d expect, but tops it all off with brilliant coils that work extremely consistently and efficiently. I use RDAs pretty much exclusively, but the UWELL Valyrian has caused me to pause for thought and give sub-ohm tanks another go. And that, for me, is very significant indeed.